Home - Visit The Crab Bag for the best of Ocean City Maryland crab houses and seafood restaurants. 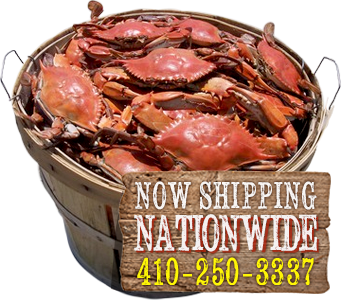 Serving only the biggest, best and freshest Maryland steamed crabs, MD crab soup, crab cakes, seafood, ribs and more. Menus - View our menu of the Best Maryland Crabs in Ocean City, MD. Specials - Take advantage of our specials at our crab house in OCMD. Crabs - The Crab Bag in Ocean City, Maryland hand grades crabs to the highest grading scale in the industry. Gallery - View images of our delicious crabs, seafood and more. Jobs - Get your next job at The Crab Bag Crab House in Ocean City, Maryland. Contact - Contact us for more information about our menu and Ocean City MD specials. We have three great feasts!!! All our crabs are #1 Premium male crabs steamed live to order. Steam Time Is Approx. 20-30 Min. So Relax and Enjoy! with Fries, Slaw, "Corn Seasonal"
Not in town, but want some fresh Maryland-steamed crabs? We ship anywhere in the continental U.S.